Open rally scheduled chart declared for Rajasthan state. 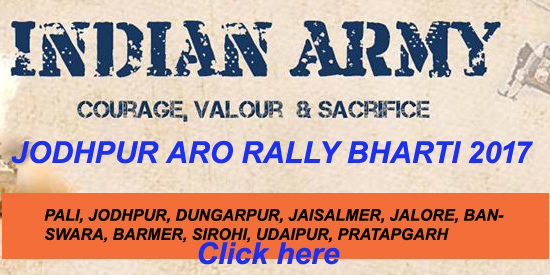 declared chart of rally bharti under the HQ RTG Zone Jaipur including following districts. 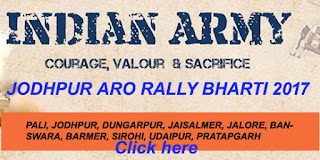 Rally dates are announced by Indian Army for following districts of Rajasthan. Under the Jqaipur ARO. Candidates who belong to PALI, JODHPUR, DUNGARPUR, JAISALMER, JALORE, BANSWARA, BARMER, SIROHI, UDAIPUR, PRATAPGARH can apply online from official website. How to Apply online :- To apply online, user must visit official website first and then click on Apply online button under the JCO? Or Enrollment section. If Candidates don't understand how to apply online then clink on given below link. In this link we previously disscussed how to apply online step by step. While applying online user must have Adhar card. Dungarpur, Banswara, Sirohi, Udaipur, Barmer, Jalore, Jaisalmer, Pratapgarh, Jodhpur & Pali. Run time :- Running time is also revised. so candidates need to work hard.